From the Grammy-nominated singer, drummer, and percussionist who is world renowned for her contributions throughout the music industry, a moving memoir about the healing power of music and spiritual growth inspired by five decades of life and love on the stage. She was born Sheila Escovedo in 1957, but the world knows her as Sheila E. She first picked up the drumsticks and started making music at the precocious age of three, taught by her legendary father, percussionist Pete Escovedo. As the goddaughter of Tito Puente, music was the heartbeat of her family, and despite Sheila's impoverished childhood in Oakland, California, her family stayed strong, inspired by the music they played nightly in their living room. When she was only five, Sheila delivered her first solo performance to a live audience. By nineteen, she had fallen in love with Carlos Santana. By twenty-one, she met Prince at one of her concerts. Sheila E. and Prince would eventually join forces and collaborate for more than two decades, creating hits that catapulted Sheila to her own pop superstardom. The Beat of My Own Drum is both a walk through four decades of Latin and pop music—from her tours with Marvin Gaye, Lionel Richie, Prince, and Ringo Starr to her own solo career. At the same time, it’s also a heartbreaking, ultimately redemptive look at how the sanctity of music can save a person’s life. Having repeatedly endured sexual abuse as a child, Sheila credits her parents, music, and God with giving her the will to carry on and to build a lasting legacy. Rich in musical detail, pop, and Latin music history, this is a fascinating walk through some of the biggest moments in music from the ’70s and ’80s. 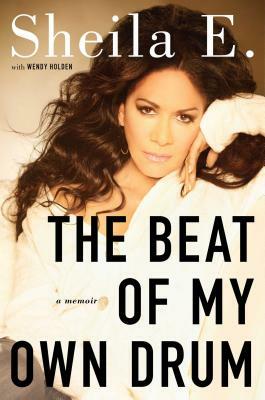 But as Sheila’s personal story, this memoir is a unique glimpse into a world-famous drummer’s singular life—a treat for both new and longtime fans of Sheila E. And above all, The Beat of My Own Drum is a testament to how the positive power of music has fueled Sheila’s heart and soul—and how it can transform your life as well. Emmy and Grammy Award–nominee Sheila E. is one of the most talented percussionist/drummers in the world. She became a top session and touring musician before the age of twenty, performing and/or recording with George Duke, Herbie Hancock, Billy Cobham, Con Funk Shun, and countless others. She later performed with Marvin Gaye on his final world tour, Diana Ross, Lionel Richie, Prince, Gloria Estefan, Babyface, Patti LaBelle, and Stevie Nicks, among others. In the 1980s, Sheila became a pop sensation with her hits “The Glamorous Life” and “A Love Bizarre.” Sheila founded the Elevate Hope Foundation and cofounded Elevate Oakland, both of which focus on the needs of victims of child abuse by promoting music as an alternative form of therapy and serving public schools with music and the arts. Wendy Holden is the author of more than thirty books, nine of which were international bestsellers. She also worked as a journalist for eighteen years. "Engrossing...the memoir has an arresting rhythm...after reading Sheila E.'s moving and restorative story, you will have an even greater appreciation for her as an artist and as a woman."